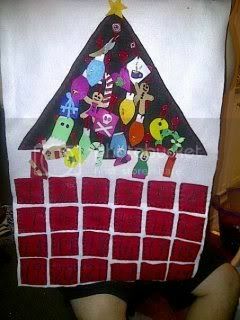 Ok I am almost finished the advent calendar. I made everything by hand and sewn everything. This will match our theme for Christmas around here. Will match the hand made stockings and hand made tree skirt. all it needs now is a wooden dowel and some ribbon to hang it up. nice work. I love this, its so cute. 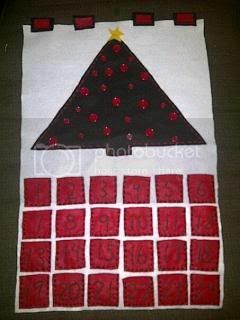 I'm in the process of making an advent calendar too! Love it! I have something similar that I put individually wrapped chocolates in. I'm a big kid when it comes to Christmas. I loved doing it. im not sure if anything other then the oranments would fit! Mine will fit one of those mini Hershey's bars you can get at the bulk barn. I think it may even fit a Lindt truffle. Nah, just one. My mom bought it for me when I was single. Now my husband and I share. That's really great, I like it! That's so cute!! Good job!